This willow has long narrow leaves with fragrant pink to lavender flowers that appear in late spring and continue to early fall. The flowers from the tree are favorites with hummingbirds and they are a fixture to the tree all summer. It's easy to grow and does spectacular inland and in the desert. 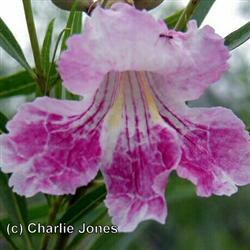 It is naturally a multi-trunk tree but can be pruned to a single trunk. Use it for summer shade in a dry garden where its dramatic blooms will draw plenty of attention.